Radishes are common spring vegetables. 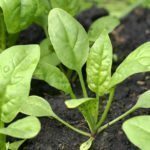 Many of us grow our own because they are easy to grow, take only about 25 days from planting until harvest and are delicious fresh or even cooked. 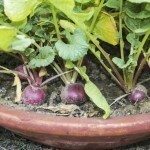 If you would like to expand your radish horizons, try growing black radishes. Read on to find out how to grow black radish and additional black radish info. Black radishes (Raphanus sativus niger) are heirloom radishes that are significantly more peppery than the rosy red radish. They also take about two to three times longer to mature than the common red radish. There are two varieties: a round one that looks much like a black turnip and a long one, which is cylindrical and can get to about 8 inches long. The long variety is more pungent than the round but both have flesh that is crisp, white and peppery. To quell some of the spiciness, remove the black peel from the radishes. Black radishes are members of the Brassicaceae or Brassica family. These annual root vegetables may also be found under the names Spanish radish, Gros Noir d’Hiver, Noir Gros de Paris and the Black Mooli. Unlike its common radish cousin, black radishes can be stored long after harvest season has past. Submerge the roots in a box or carton of moist sand and then place it in a cool place that won’t freeze or keep black radish in a perforated bag in the refrigerator. Growing black radishes has a lengthy history. Ancient Egyptian texts write of feeding radishes, along with onions and garlic, to the pyramid builders. In fact, radishes were grown prior to the building of the pyramids. Evidence has been found in excavations. Black radish was first cultivated in the eastern Mediterranean and is a relative of the wild radish. Growing black radishes became popular in England and France in the 19th century. Black radishes can be used fresh, sliced into salads or cooked in a variety of ways. They can be sautéed and served as a side dish vegetable, cooked like turnips and doused in butter or cream, diced into soups, stir fries and stews or sliced and served with dip for an appetizer. Traditionally, black radish uses have also been medicinal. For hundreds of years, Chinese and European people have used the root as a gall bladder tonic and remedy for bile and digestive issues. In India, where it is called Black Mooli, it’s been used to treat liver problems. Today, black radish has been shown to fight off infection and promote healthy digestion. It also contains raphanin, which can be of benefit to those suffering from either an over or under active thyroid. 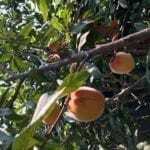 The leaves are also purported to have a liver detoxifying effect. The root is very high in Vitamin C and also contains potassium, iron, magnesium and the vitamins A, E, and B. You can buy it at herbal supplement stores in capsules or tincture forms. Grow black radishes much as you would the common rosy radish, although as mentioned they will take longer to mature – about 55 days. 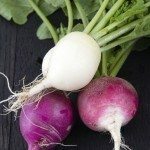 Plant black radish from mid to late summer (or in the fall in mild climates) either directly sown into the garden or started indoors to be transplanted. Space the plants 2-4 inches apart or even farther if you want larger radishes. Sow the seeds in well-draining, loamy, soil that has been raked free of stones. Situate the radish bed in an area that gets at least 6 hours of sun and with a soil pH of 5.9 to 6.8. Black radish care is minimal. These plants are unfussy as long as you keep the soil slightly moist. You can pick black radishes when they are 3-4 inches across. Healthy radishes will have an even black to dark brown skin and will be firm and smooth. Avoid radishes that give in to a light squeeze as they will be pithy. You can then eat your radishes immediately after harvest or store them in the refrigerator for up to two weeks. Remove the greens and wrap the radishes in plastic first. If your radishes are a little too hot for your liking, peel them, slice and salt, and then rise with water before using.